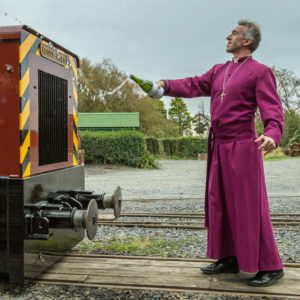 Bishop blesses latest arrival at Talyllyn Railway | News by Wales Express News, People Before Profit! The Bishop of Bangor, the Right Rev. Andrew John, formally named Talyllyn Railway’s latest diesel locomotive, No.12, St Cadfan, at Tywyn Wharf Station on Sunday. The Bishop of Bangor anoints diesel No.12 St Cadfan with bubbly during the naming ceremony at Tywyn Wharf Station on Sunday. The name was chosen to commemorate St Cadfan who established a Christian community in Tywyn 1,500 years ago. The naming ceremony was part of the celebrations taking place this year to mark the event. Bishop Andy, as he likes to be known, is no stranger to the railway, having taken part in a number of events over the years. During the short ceremony, he performed a blessing and then unveiled the nameplate before anointing the locomotive with a bottle of bubbly. There to witness the occasion was a large group of invited guests and onlookers. They represented the local community and churches as well as those who had been involved in bringing the locomotive to Tywyn from the ex-Royal Navy Ammunition Depot at Trecwn, South Wales. No.12 is a Baguley-Drewry four-wheel diesel shunter which will be used for engineering trains. Built in 1983, it was part of a class of seven diesels used on the 2 ft 6 in gauge railway at Trecwn. Upon the closure of the depot, three of the class were purchased by a consortium of Talyllyn Railway Preservation Society members in 2008 and brought to Tywyn where they remained in storage at Tywyn Wharf Station. Ownership of the locomotives was eventually transferred to the railway and two of them were sent to Alan Keef Ltd’s works near Ross-on-Wye for re-gauging to the Talyllyn’s 2 ft 3 in gauge. The third locomotive is being used for spares. This class of diesel was especially built for the depot at Trecwn with 99bhp Perkins engines to cope with the gradients on the system there. They have an air-operated transmission and chain-drive to the axles. Both locomotives will eventually be fitted with air brakes to allow them to work a passenger train in an emergency. St Cadfan has been repainted in Indian red livery similar to that currently carried by the Talyllyn’s two original steam locomotives Talyllyn and Dolgoch. It is planned that the other locomotive will also be repainted and named Trecwn in due course.